Plastic is ubiquitous in modern life; because its form is pliable, it can be molded into everything from food packaging to chairs to car parts. 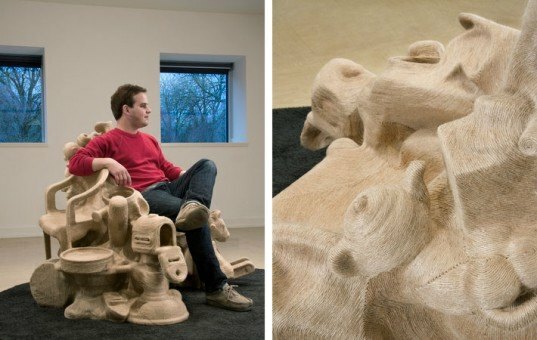 Using discarded plastic objects and wrapping them in jute (plant fiber) string, Korean-born artist Jay Sae Jung Oh created Savage Chair, an incredible pile of mass-produced objects whose plastic texture is hidden beneath a natural material. Oh’s art is a commentary on plastic’s quality as a universal substance that can be formed into any shape. By combining the plastic objects and covering them in jute string, the objects take a new form with new meaning — even though it’s pretty easy to pick out distinct shapes. It’s as if a room full of common household goods were suddenly tossed in a pile and entombed in khaki-colored string. Oh's art is a commentary on plastic's quality as a universal substance that can be formed into any shape. By combining the plastic objects and covering them in jute string, the objects take a new form with new meaning -- even though it's pretty easy to pick out distinct shapes. It's as if a room full of common household goods were suddenly tossed in a pile and entombed in khaki-colored string. "The concept came from a desire to transform industrial, mass produced objects into new hand-made, high-value entities,” Oh told Co.Design. "These discarded items represent industrial society, and a conflict arises when they’re wrapped in the natural fibers of jute." 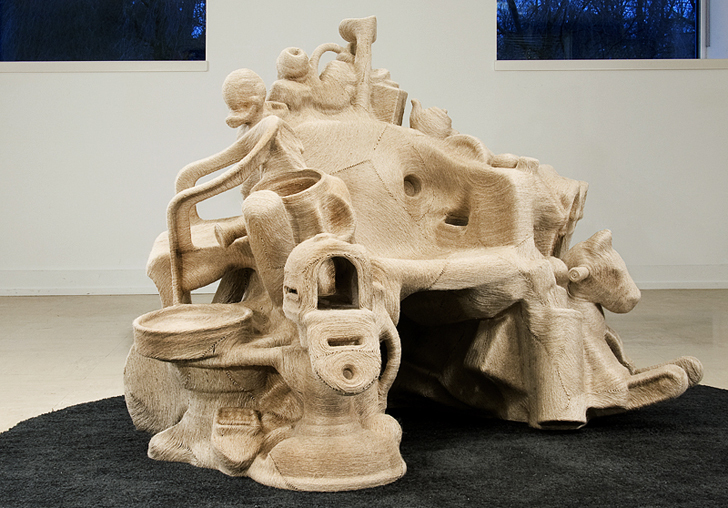 Savage Chair has been added to the permanent collection of Detroit’s Cranbrook Academy of Art. Savage Chair is similar to (but much more ambitious than) Oh's previous work, the Jute Side Table, which consists of 12 manufactured plastic objects that are covered in jute string and formed into a functional side table.